As a child, Leonardo Alcantar showed a deep interest in computers. No, not gaming — the actual inner workings. "When we first moved to the U.S., we didn't have much money," Alcantar said. "My father brought a broken computer home and since I really wanted a computer I had to figure out how to fix it myself. Once I got it working, it really sparked an interest in technology. From that moment on, I knew that I liked fixing things and making things." Alcantar grew up near Duluth, not terribly far from the St. Scholastica campus, and dreamed of attending CSS. But, as a native of Mexico, his expectation was that he'd return home after high school. There was no push to apply to college since he assumed he'd be long gone. But he didn't return home — in fact, a series of events landed him in Mankato, Minn. 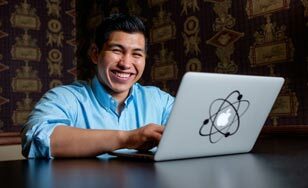 Wanting formal education and a career in information technology, Alcantar enrolled in a technical college in Mankato to gain an associate degree. Before he knew it, his aptitude and proficiency with IT led to a job offer at First National Bank Minnesota. Later, a colleague and mentor urged him to consider starting on his bachelor's degree at the same time. In searching for degree completion programs, Alcantar always kept St. Scholastica in mind. He'd read about the Computer Information Systems (CIS) program, then came across the SUCCEED program — a unique blend of online coursework and face-to-face campus support for students at the St. Scholastica campus in St. Paul, Minn. Plus, SUCCEED offers a significant tuition discount. "What I really like about the SUCCEED program is the time you get to spend with your mentor — someone who already has professional experience doing what you want to do," Alcantar said. SUCCEED students are expected to participate in a number of events each term, as well as meet with a mentor who helps to set goals and plot a course toward graduation. Alcantar isn't content to graduate in Fall '16 and continue on this path in information technology. He's interested in earning a master's, too. "I could get into software engineering, but I haven't decided yet," he said. "I want to start right away, but if I have to wait a year or two it'd be fine because I'm still getting experience in the field." He has a seemingly endless drive to increase his skills. Alcantar is concurrently finishing his associate and bachelor's degrees — while also pursuing certification through Free Code Camp. As a resource for nonprofits, Free Code Camp connects coders with organizations to deliver software development at no charge. "After about 2,000 hours of coding, you receive a certificate," Alcantar said. "I should have all three certificates for (full) development within the next few months." He hopes to mentor others in the future, in gratitude for the people who have invested in him both at CSS and beyond.